Showtime Amusements Bouncy Castle, Fairground rides and Mascot Hire are based in Mablethorpe, Lincolnshire. We aim to make local kids (and grown-ups!) happy and only supply the best equipment for your event. 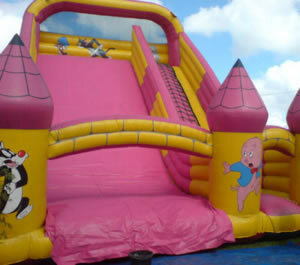 We provide super bouncy, indoor or outdoor bouncy castles to fit all budgets. When you hire from Showtime Amusements you get the very best high-quality inflatable structure, top bouncyness and guaranteed fun!! We also deliver it, perform a total safety inspection, erect and secure it. When the parties over we deflate it and take it away. All of our bouncy castles are perfect for kids and most are suitable for adults, (please check when booking). Our castles have specially reinforced seams, thicker material, and extra-tall walls. Come on grownups don't miss out on all the fun! Here at Showtime Amusements we think that there is no age limit of having a great party! Our Mascots will bring that finishing touch to any event whether it is a small child's birthday party or local fun day. Please look at all of our bouncy castles and Mascots for hire, and if you’ve got any questions don’t be afraid to ask! We can also provide those little extras such as smoke machines and silent generators..